The Breyer Running Stallion Mold is an action packed horse model that sparks the imagination. It is no wonder that these models, especially the vintage and retired ones, are so popular with collectors. This model may look familiar to you as he graces the top of every page of our site. The difference with this picture is that the background is red. 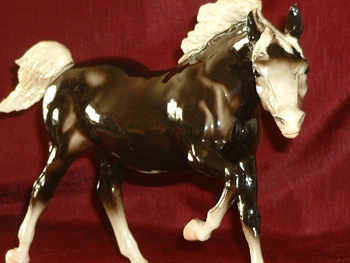 This Glossy Charcoal Breyer Running Stallion was produced from 1968 to 1971. He is both a vintage and retired model. 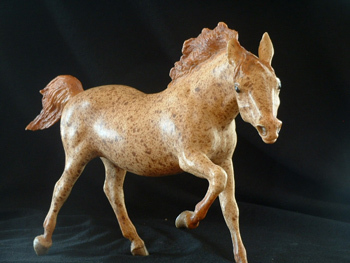 In our second picture to the right is another vintage and retired model, the Red Roan Dappled Breyer Running Stallion. This model was produced from 1968 to 1974.